This year I decided amongst many other things that I was going to stop buying fashion jewellery. The reason for this is due to the fact that I was fed up of it turning a nasty shade of green or yellow after a certain amount of time. I’m not sure if I will stick to this completely as there are some amazing pieces of fashion jewellery out there and of course it’s so much cheaper compared to real metals. There is also such a variety of styles too so certain things do last longer than others. 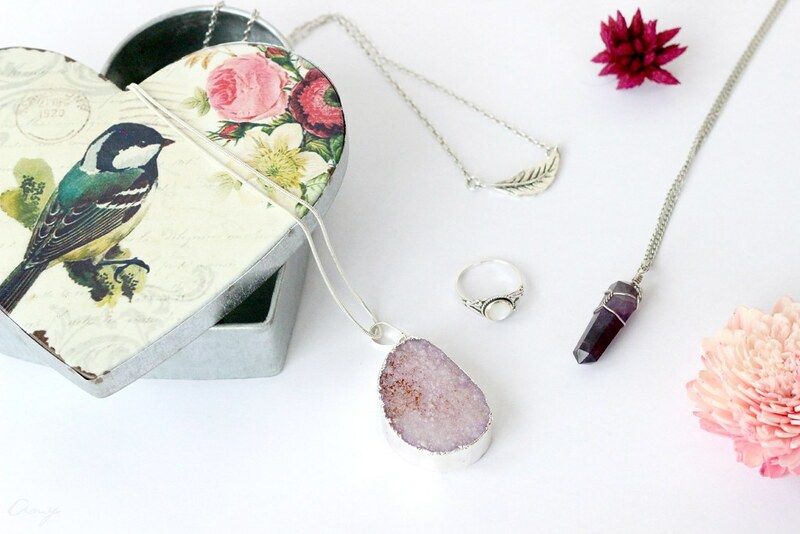 Recently I added a new necklace to my collection which is a Purple Druzy Necklace from Delilah Dust. Placed upon a silver plated chain I think it is gorgeous and is so different to anything else within my rather small collection. I’ve never had a silver plated item before so I’m seeing how this wears; fingers crossed it will last me quite a bit. My little amethyst pendant and silver chain is from Dixi a little over a year ago whilst the silver ring is from Accessorize. Speaking of Accessorzie they have some really beautiful sterling silver rings in quite a lot of the time that I think are rather reasonably priced; it’s always a place I check these days for nice little rings. Being a huge fan of jewellery, silver in particular I’m always on the lookout for more unusual pieces therefore if you have any recommendations then please do leave a comment below letting me know.